Roger Mason Jr. has been a revelation for the San Antonio Spurs, helping them stay afloat as they've tried to weather the injuries to Tony Parker and Manu Ginobili. He's posted a PER of 16.58 to date, topping last year's 13.80, which was the first season in which he'd had a PER above 7.71 or a FG% above .355 in the NBA. 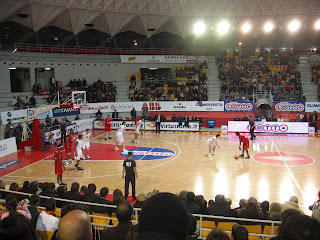 That's a photo from three years ago, when I was in Rome during Thanksgiving week, and caught a ULEB Cup game (it's similar to Euroleague, but with the next-best teams across Europe, much like the UEFA Cup in soccer) between Lottomatica Roma and Hapoel Migdal Jerusalem. That is Roger Mason at the bottom of the photo, with a headband, standing behind the three-point line. He played for Jerusalem and had a nice game that evening, with 22 points on 6 threes in 37 minutes. The point guard in the photo is Horace Jenkins, and he caught my eye at the game, not just because he's a D3 legend, but also because just five months prior to this photo, he had been sitting behind the Pistons bench during the NBA Finals, on the roster but inactive. I was just struck by what a thin line it is for guys like this, who are on the border of NBA rosters, between the glamour of the NBA stage (the biggest stage, in Jenkins' case) and the complete lack of fanfare of playing before 2000 people in Europe. I know this is nothing earth-shattering - the stories of guys like Stephen Jackson and Mario Elie who've hooped around the globe before settling in the league are well-documented, and Paul Shirley's made a living off of the storyline. It was just somehow more stark to experience it in person, in a high-school-sized gym whose "amenities" consisted of one high-school style concession area in the surrounding hallway (there were no "concourses"). Don't get me wrong, it's still a pretty nice life, getting paid six figures to play a game and travel the world. It's just such a narrow line between the fame and dream of the NBA lifestyle, and obscurity. In any event, I'm sure that Roger Mason, after signing a 2-year, $8M deal with San Antonio this summer, is especially thankful to be securely in the NBA this Thanksgiving. Best of luck to the many players toiling around Europe trying to keep their NBA dreams alive. And Happy Thanksgiving to all of The Painted Area's readers out there. Don't forget that the Hornets-Nuggets game at 10:30 ET on TNT is a hell of a lot more appealing than any of Turkey Day's NFL games. I'm sure the Spurs are thankful too. Good stuff. Did anyone else notice that the picture is one of the ultra-rare basketball action shots that captures the exact tiny fraction of a second when the dribbled basketball is contacting the floor?